Throughout 2018, I wanted to create a mini series for my followers and readers who own small businesses or are wanting to improve their social media images. Specifically, I wanted to create a selection of posts including a few tips and tricks of the trade that are easily recreated at home if you are unable to get a professional on board, so that when I get questions from my lovely clients about how they can improve their photography, I could point them in the right direction. To get us started I wanted to create a guide to the humble flatlay, a simple yet effective way of displaying and photographing products. 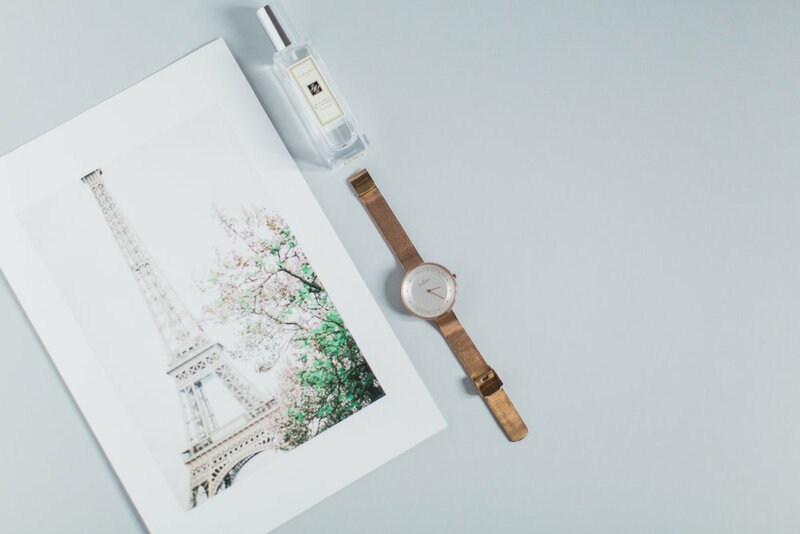 Here are my top tips for achieving flatlays that your favourite blogger would be envious off. There is a reason I titled the post the way I did, simplicity really is key if you are new to flatlays. There are a few reasons for this, the first being the fact that flatlays have a tendancy to look cluttered, a bad flatlay can look more like a photo of a pile of mess than anything else and if you bring too much to the table, you will find it very hard to make the focus of your image stand out. Another reason is that flatlays are deceptively difficult, the more practice you get the more you might want to experiment with extra props, but by sticking to two or three perfect props you will have more impact than if you have 20 random items picked from your drawer. Your Main Focus - the focus of all the flatlays in this post are my prints, so just remember to collect your props based on whatever product you want to feature. You may want to collect some pretty calligraphy pens and inkwells if you are a stationer, for example. Silk Ribbons and Fabrics - I purchase mine from the lovely Kate Cullen (she also produces these amazing styling kits and a selection of props if you want a flatlay one-stop shop. These are great for varying the texture of your image and can mean the difference between a clean minimal flatlay and a soft dreamy flatlay. Magazines - my FAVOURITE being Cereal, you can use covers and the inside pages for varying backgrounds. Art books are also great for adding layers and depth. Foliage -This is particularly easy for me as my home is filled with an array of plants. Foliage adds an instant natural feel and also a pop of colour if you like to keep your images super neutral like me. Above anything else, setup is vital. The golden rules of the perfect setup are good light and a good background. The setup in the image below is a piece of grey mountboard and two pieces of white foam board all purchased from Hobbycraft. this setup cost me all of around £8 but is ideal for flatlays, product photos and styling details alike. I always use natural light, so by positioning the mountboard near the window and placing the foamboard behind and beside the card, I am able to knock out the majority of the shadows for a soft, clean light across my images. Now is for the fun part, the laying out of your props. This bit is really up to you and your eye, and will require a lot of trial and error the first few tries. Try experimenting with negative space, symmetric lines and varying textures. Try swapping out the props surrounding your focus peice and working out what vibe you want to go for. Start small and grow your flatlay. I always start with my focis piece, then lay the rest of my props around it, take a snap, then analyse what works and what doesn't, whether it is too much or too little, whether it feels right. When it clicks I shoot the image from a few angles and pick my favourite composition before editing and uploading it. In conclusion, I think getting the perfect flatlay takes practice and honeslty quite a bit of time. I reccomend shooting a few different flatlays of a few different prodcucts in one session so as to have a collection of pretty images to upload, rather than having to nail our setup every single time you get an idea or want to upload a flatlay! If you try any of these tips yourself, please let me know and I would love to check them out! © Bethany & James. All rights reserved.